Keita Takahashi makes bright, cheery games with fun soundtracks. His latest such game, Wattam, is set for release from Annapurna Interactive some time this year. It's about a bright green cube called Mayor who begins the game profoundly lonely, but makes friends with an assortment of unusual entities by holding their hands and entertaining them with explosives he keeps hidden under his hat. It's bizarre and charming and fun, but there's a morose undercurrent to the whole thing. In that sense, it's a lot like Takahashi's previous efforts Katamari Damacy and Noby Noby Boy. In the former, players rolled a ball that grew by swallowing up anything smaller than itself, including (eventually) people whose terrified screams and fleeing suggested they did not want to become one with the ball and end up launched into space to become a new star. In Noby Noby Boy, all players shared the goal of physically stretching their caterpillar-like characters as long as possible, as their cumulative length helped a separate character complete her own lonely journey through the solar system over more than six years. 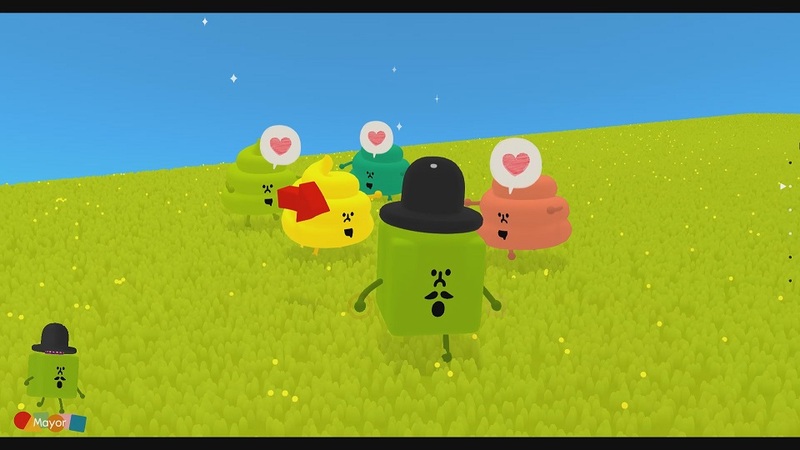 Wattam's Mayor makes friends with all kinds of... stuff. At the risk of extrapolating too much from a 20-minute discussion on the final day of a grueling E3, these games and their distinct blend of endearing joy tinged with melancholy seem like suitable reflections of Takahashi himself. He clearly values things like love and joy, and he laughs with almost every answer, but the words themselves are often dour or discouraged, either explicitly or by implication. Speaking with GamesIndustry.biz, Takahashi discussed his career candidly, starting from his unlikely entry into gaming with Namco. "Before I joined Namco, I didn't have any computer or game console," Takahashi said. "At art college, I studied sculpture. Then somehow I joined the game industry. I was an artist, not a game designer, when I joined Namco. But I was thinking I should make a video game, because this is a video game company. Also, the boss who hired me believed I had a good talent to make a video game. My boss told me, 'Hey Keita, you should think about your idea for a new game, because the [existing] games are so boring.' And I agreed." 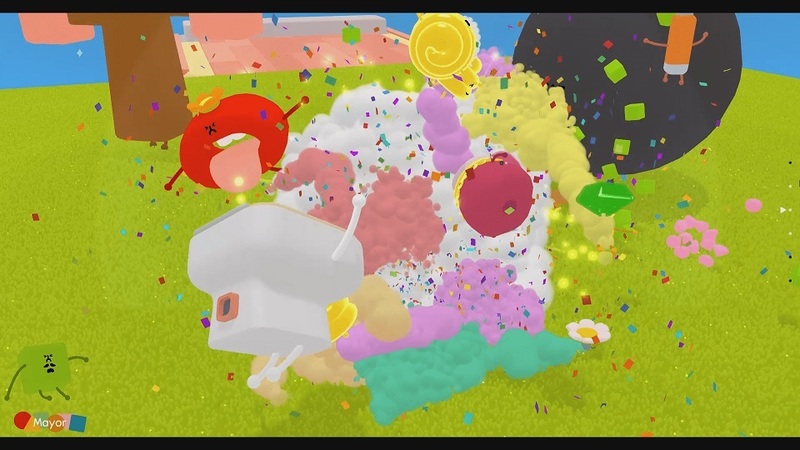 Takahashi said his goal with Katamari was to show players and publishers alike that games could be different, that they could evoke different feelings and moods compared to the hits of the day. While Katamari wound up a critical and commercial success, Takahashi was unwilling to declare it a personal one. "I don't know if it was a success," he said. "I know Katamari made some people happy, but maybe just a small amount of people, not like a AAA title with a million billion people. Not like a Fortnite or a GTA, blah blah blah. I don't think I made change [in the industry], or just not enough." With Wattam, Takahashi is still trying to change the way people think about games, but that's a tall order, and the creator seems almost resigned to falling short of that goal. "I'm not optimistic," he said. "For me, it's still not changing. It's still the same." His continued attempts to push against the status quo are admirable, but they do make things more difficult. Takahashi said his biggest challenge he struggles with for Wattam is simply that he doesn't know if anyone else will like it. At the very least it's a familiar challenge, as Takahashi felt the same way with Katamari and Noby Noby Boy before they released. "Shooting or fighting is kind of fun. But as a game designer, that's kind of sad, because we couldn't provide a different perspective for the player"
"It's never changing," he said. "It's always like that. Because I'm trying to go against the current trend of game we have right now. You know, shooters or fighting games. They never change, but almost all people love that kind of game, which I understand. Shooting or fighting is kind of fun. But as a game designer, that's kind of sad, because we couldn't provide a different perspective for the player. I understand fighting is fun, but this is a different perspective of fun. I still believe games are a very unique media, which is interactive, has music and vision, can provide you with a more emotional story. But we still provide the player a very tiny, small perspective of life experience." Part of Takahashi's uncertainty about how Wattam will be received is no doubt because it's so strikingly different from other games on the market, but part of it can probably be blamed on Takahashi's own development process. "I don't like to get any feedback," he explained. "So people are surprised. I didn't do any play test of Katamari or Noby Noby. No public play test, just internal or QA only." He added, "I still don't have any confidence about my ideas... Many people give me feedback, but I know somehow when it is not correct feedback. This is not what I want to do, so I just say no, no, no. Maybe I'm just stubborn." Partway through the interview, we ask Takahashi if he thinks his personal frustration, pessimism, and other less-than-joyful sentiments are clearly represented in his games. "It's hard to describe," Takahashi answered. "You know comedians? Do you think they're always being funny? I don't think so." All perfectionists are never happy. Not sure if "negativity" is the optimal word, because it is not that negative to just be unsatisfied. Nor is it to accept that being completely satisfied is near impossible. Between lines, it is actually cool words for saying that he has much more to offer than what he could so far. Rather positive. We have to cultivate the doubt. Maybe his games are not commercially successful, but I really like them just because of how out-of-the-box they are. I'll play anything Takahashi-san puts out there. I am sure his work made a change in the industry. I think the reason most people haven't played these is that they've been released on the wrong platform. If Katamari or Noby Noby Boy were on PC, on Steam, I'd bought them - but they aren't. It seems like Wattam has a Steam page though so I'll definitely buy it if I have money.